The breed is fairly recent, having been created in Austria from a cross between a Hanoverian Scenthound and a coarse haired Istrian Hound. The best puppies from the litter were kept and used for selective breeding to create the Styrian Coarse Haired Hound. 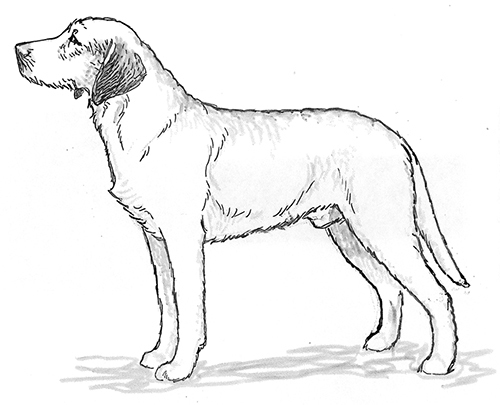 The Styrian Coarse Haired Hound was recognized by the United Kennel Club in 2006. A medium sized, rough coated hound with a serious expression. A passionate, tough hunter and a determined tracker. The skull is slightly rounded. There is a well developed occiput. The muzzle is strong and straight. The lips are not pendant. The Styrian Coarse Haired Hound has a complete set of evenly spaced, white teeth meeting in a scissors bite. The absence of one or two premolars is not a fault. Disqualifications: Overshot or undershot. Missing teeth other than two premolars. The ears are not too large. They are flat lying and covered with fine hair. The medium length neck is strong. The legs are straight and muscular. The chest is deep and broad. The back is straight and broad. The loin is moderately tucked up and the croup is sloping. Muscular, strong, and well angulated. The legs are straight when seen from the rear. Not too large, with well arched, close toes and hard pads. Medium length, strong at the root, and carried upward in a slight sickle. There is a brush, but not a plume, on the underside. Faults: Tail too short, too thin or too curled. Plume on tail. The coat is rough, harsh and coarse, but not shaggy. The coat on the head is shorter than on the body, but it forms a mustache. Faults: Coat too long, thin, curly or soft. Red or fawn, with white marking on the chest permitted. Height at the withers is 18 to 21 inches. Missing teeth other than two premolars.